"Wow, I can't say enough how awesome these folks are. I placed a Christmas order with less than a week until the big day and it was fulfilled and under the tree in just days. Thank you! The quality is outstanding, the packaging rivals the best and most of all, my daughter loved the uniqueness. You have a client years to come." - Mike F.
Customer Satisfaction - We have hundreds of Customer Testimonials about the outfits our customers purchased that fit their American Girl Doll ™®. You can feel assured that we are a trustworthy, reliable company focused on customer happiness. Fast, Low Cost Shipping - All of your in-stock doll clothes or doll furniture orders are shipped the same or next business day. We have a flat-rate shipping option of $2.95 for 18-inch clothes/outfits orders, and those orders receive FREE shipping over $35. For furniture orders, we have a flat-rate shipping option for $5.95, and those orders receive FREE shipping over $75. 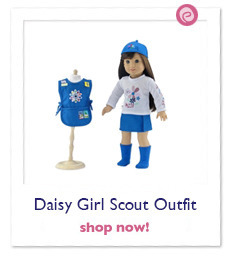 Product Quality - We are proud to offer high quality 18 inch doll outfits and dresses for American Girl products. I personally inspect all 18 IN outfits prior to listing. We have a focus group of young girls that approve products and we have the product reviews right on our product pages. Our 18" doll furniture is top-notch. 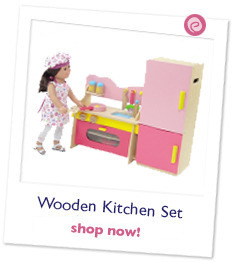 Most have exquisite hand-painted details and are durable wood products for years of play. Selection and Choice - We are sure you will find something to suit your needs. We have casual doll clothes, which includes skirt outfits for 18" dolls and pants outfits. Browse our store and you can find evening dresses for 18 IN dolls, day dresses, great party dresses, and historical doll dresses too. You can also check out our doll sports clothing outfits. Our costumes section has a huge number of great choices. Our 18 inch clothing for bedtime give you plenty of choices with pajamas and robes. Let's not forget our 18 inch doll furniture. We offer a gorgeous bunk bed to fit your American Girl ™® doll, a matching armoire for all the Emily Rose doll clothes you buy :-) and even a matching set of 18 inch doll table and chairs.